Known as one of the fastest indigenous watercraft in the Pacific, the Marshall Islands outrigger canoe has over the years been fine-tuned to sail closer to the wind than any other modern sail craft in the world. Little has changed in the basic design of the outrigger canoes over the past 100 generations. In centuries past, the people of the Marshall Islands sailed upon ocean voyages of up to 500 miles as a matter of necessity, usually to access food. 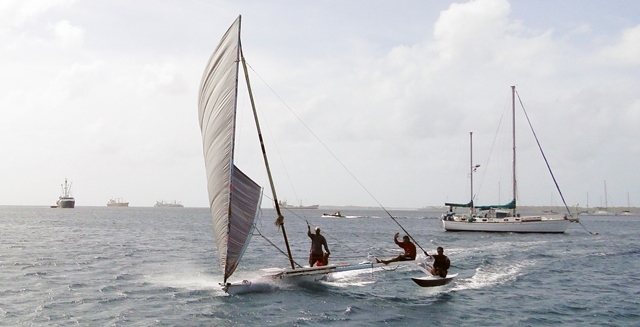 Today, sadly, canoes have been largely replaced by power boats, with most new canoes in Majuro being built for racing. Of the outer islands, only a few still use the canoes as part of their livelihood, with Ailuk Atoll being a prime example. While newly-built tradition-style outrigger canoes look extremely similar to the original boats, they are shaped not with the simple hand-hewn tools of the past, but with electric saws and planes. They are not rigged with a sail made from the fibers of the pandanus plant, but instead with modern fabrics, including tarps. Whatever their purpose, the very existence of the canoes is treasured by the community as a source of national pride.